Broncos quarterback Peyton Manning is ready to work with Gary Kubiak's new offense in Denver. ENGLEWOOD — Keep the ice packs in the cooler. Hold off on that rocking chair. Declaring he feels good both physically and mentally, Peyton Manning made it clear Tuesday that he doesn’t view the 2015 season as his farewell tour. “I wouldn’t call it that. That’s not how I see it,” the 39-year-old quarterback said in his first public comments of his offseason. He stressed that he views such chatter as neither offensive nor motivating as he prepares for his 18th NFL season. Manning spent several weeks mulling his future after Denver’s playoff dud, a 24-13 loss at home to his old team, the Indianapolis Colts. After deciding to put off retirement, he accepted the first pay cut of his career, giving the cash-crunched Broncos $4 million to address their roster needs. Manning declined to discuss those matters Tuesday, saying he was focused on learning the new offense under a new coaching staff. He also demurred when asked about the challenges or nuances of running the new hybrid offense. Coach Gary Kubiak and his quarterback began meshing their philosophies in earnest during their first minicamp workout together. The highlight: Manning practicing roll-outs that were reminiscent of his father Archie’s playing days. Four days after general manager John Elway laid into Pro Bowl receiver Demaryius Thomas for skipping the team’s offseason program, Manning said he’d love to have his top target on hand but understood his absence. Thomas is boycotting the Broncos’ workouts after being franchise tagged as he angles for a long-term deal instead. There are concerns a prolonged boycott by Thomas could hinder the installation of Kubiak’s offense, which will feature Manning’s tactical and timing proficiencies while placing a greater emphasis on the run and two-tight end sets. Elway has said this new offense will save Manning’s arm, and Kubiak has suggested he might manage Manning’s health by giving him some breaks in the fourth quarter, getting backup Brock Osweiler on the field more. That’s another matter Manning declined to discuss. Kubiak said working with Manning is everything he thought it would be — and awfully challenging. 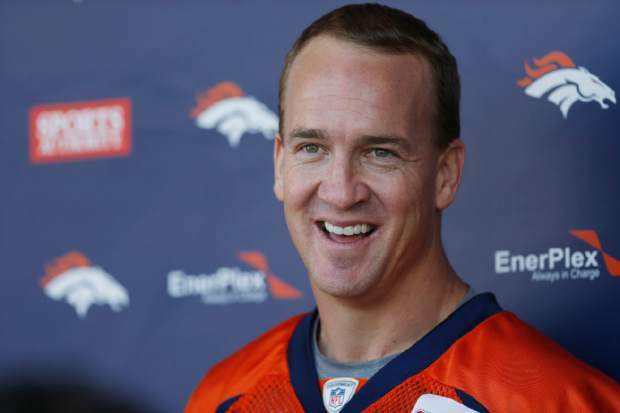 Despite being a student of the game, Manning said he hasn’t studied how other 39-year-old quarterbacks fared.